In 1983 I was asked to design a new type of catamaran by Bob Sutton. He knew my track record of designing fast trimarans and after some initial discussions he decided he liked my ideas about how to design a cruising catamaran with low windage, thereby improving windward performance and possibly even achieving the kind of tacking angles that I considered normal for a well designed trimaran. My idea was to flare the hull above the waterline in such a way that the underwater shape of the hull could be the optimum for the waterline length and displacement. The accommodation could then be increased from about knee height to head level by a flare. It was essential to keep the flare high enough so that it did not affect the sailing qualities of the boat in any way. See fig 1. 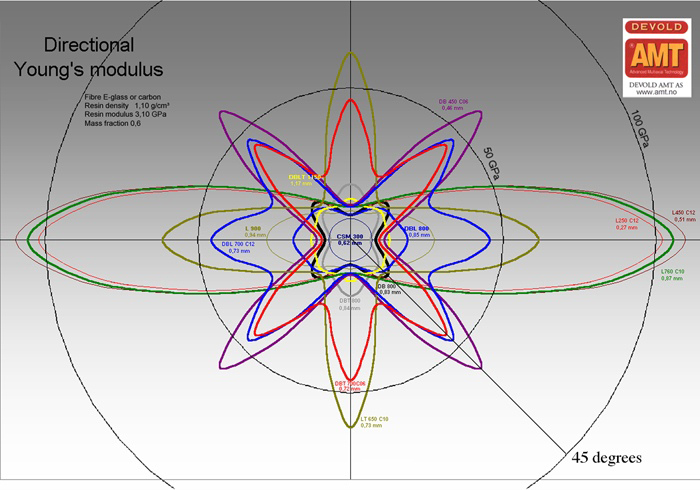 (Spectrum 42 hull section). If the flare were lower it would increase hull drag too much and also increase heaving in a seaway. Fig.1 Spectrum 42. Drawing shows how sharp deck edges cause turbulances and how counter surfaces can be placed to take full advantage of the cabin sole width. 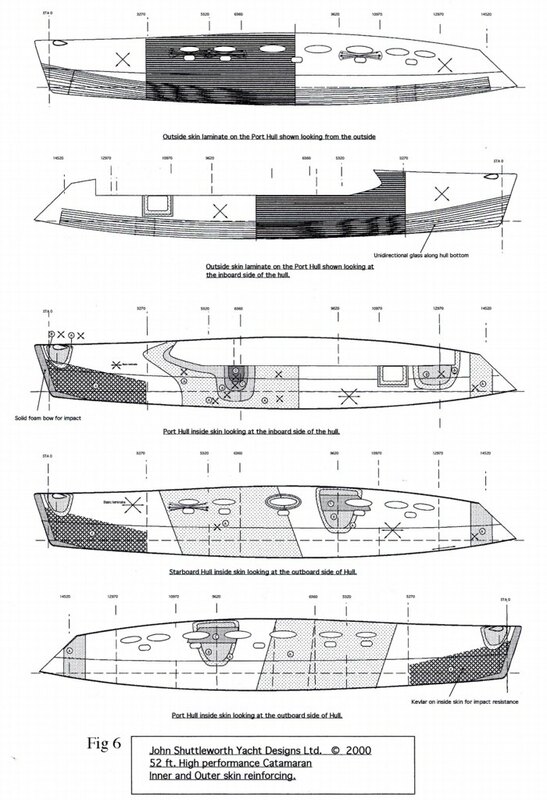 The hull shape of the Spectrum 42 had flat topsides to make the building process easier. The deck edge was a small radius (about 25 mm) and the deck had a slight camber. In addition to increasing the accommodation space the flare creates a number of additional benefits to the sailing properties of the hull. The aft sections rise vertically off the water, while the forward sections are flared out so that, as the hull sinks into the water (as the boat heels), the centre of buoyancy moves forward. This has the effect of keeping the bows up when fast reaching, and also dampens pitching. Also the flare forward gives extra reserve buoyancy to prevent the bows burying when surfing fast down a wave. In the position shown in fig. 1 the flare deflects waves rising up the hull and reduces slamming on the bridgedeck sole. The forefoot of the hull is rounded but not too full. The effect of this is to dampen pitching further. As the hull drops the rounded section resists the downward movement. So as the boat goes over the top of a wave the bows do not drop as quickly or as much as a sharper v shapes would. The flare more than doubles the inside space. The cabin sole is at the full width of the hull and the counter surfaces extend out over the flare. At eye level a 40 ft hull is about 8 feet wide in the middle section where the galley is situated. See fig 1. The flare does not increase the windage of the boat at all, because the boat is never sailing straight into the wind. When sailing to windward, the apparent wind angle may be in the region of 30 degrees. Thus it is far more important to reduce the overall height of the boat than to make the hulls narrower. All the boats built to this design like the Spectrum 42 and 43, the 35 ft 'Two Hoots', and the Advantage Arrow 'Private Dancer', have been successful, winning local races and making fast Atlantic crossings. (typically - Canary Islands to Barbados in 14 days). 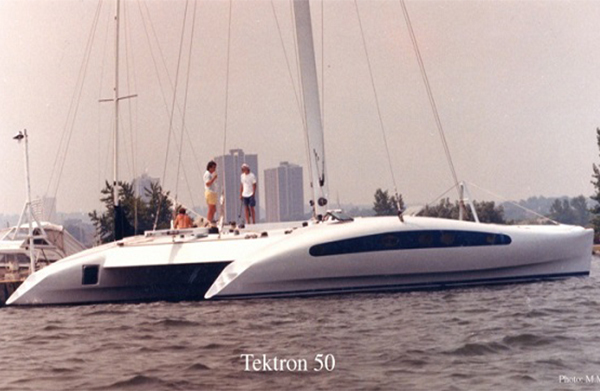 When Eugene Tekatch approached me in 1987 to design the Tektron 50 I had the opportunity to make the next development in the hull shape, which was to round the deck edges. (Ref. 1). This has the effect of reducing air drag of the hulls by about 10 %. See fig. 2. All my cruising designs that have this feature will sail to windward almost as well as an equivalent cruising trimaran. The trimaran still has an advantage in waves because the outrigger can be used to dampen pitching better than can be achieved in a catamaran (Ref. 4). On a trimaran the outrigger centre of buoyancy can be in any position when the boat is at rest, but in a catamaran the centre of buoyancy has to be exactly below the centre of gravity in each hull. This limits the amount of movement in the centre of buoyancy as a catamaran heels and hence the pitch damping that can be achieved. Fig 2. Tektron 50 vs Dogstar 50. Air Drag is reduced by lowering the overall height of the hull and by changing the shape to allow more air to go over the hull and less to go down the hull side. 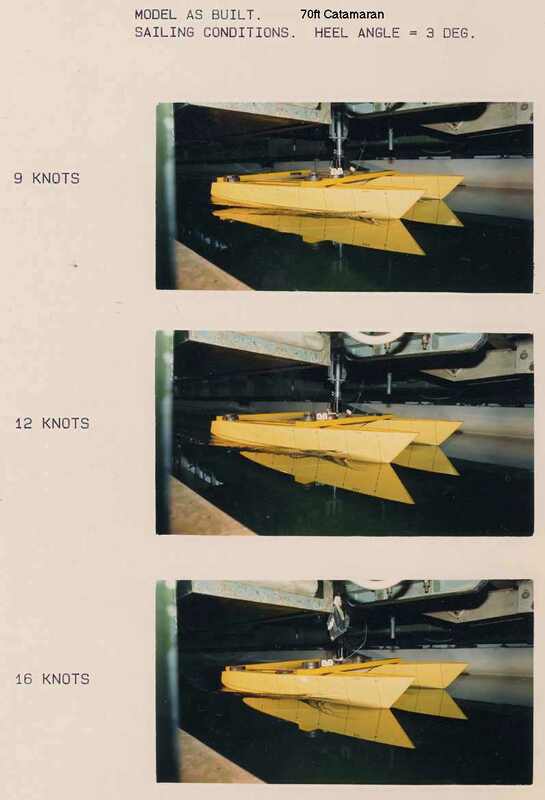 Tank testing was carried out at the Wolfson Unit in Southampton on the hull of the Tektron 50 to provide a yardstick for future designs and to facilitate accurate performance predictions. 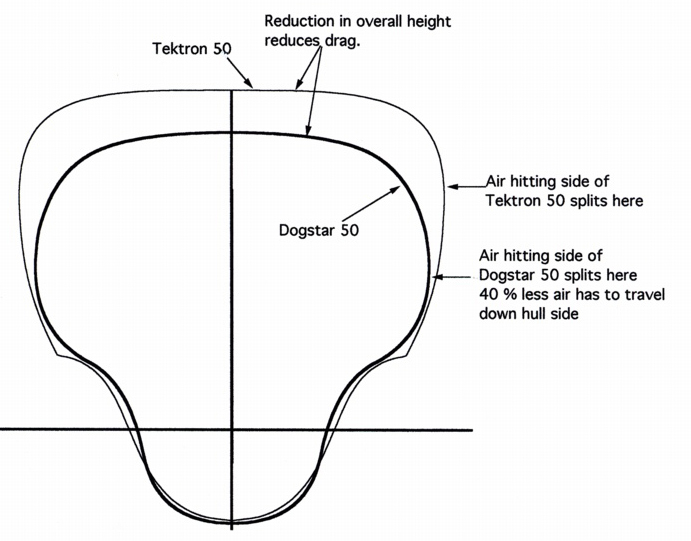 The performance calcualtions for the Tektron 50 are derived from the actual performance of the boat and the tank test data to find the hull drag. In 2000 I was approached by Peter Bryant to design a new up do date version of the Tektron 50, He wanted a cruiser/racer that could beat the current 40 ft racing trimarans racing in Britain. The first step was to make an up to date evaluation of the performance of the Tektron 50 based on the actual sailing performance, and the tank testing of the Tektron 50 hull that I carried out after the boat was built. These results would indicate where the greatest gains could be made in improving performance, and give a more reliable prediction of the performance of the new design. The results of these computations are shown in Figs. 3 and 4. 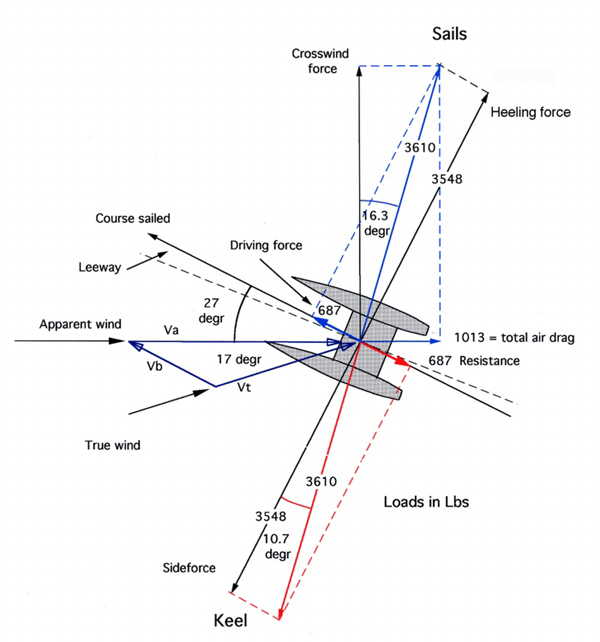 Fig 4. shows that when the Tektron 50 is sailing to windward at 12.5 knots in 19 knots of true wind, the sideforce is 3548 lbs and lift and drag components break down as follows - see table 1 (Ref 2). The most effective ways to reduce the drag in the water are to reduce weight, to design efficient hull shapes, and to increase waterline length. Our tank testing programmes over the past 10 years have shown that hull drag can vary by as much as 10% for some of the hull shapes currently being designed for multihulls, and this is further complicated by the fact that one hull shape will show less drag at low speed or at deeper immersion than another. The design of a hull shape that has low drag over the anticipated speed range, and will also have low drag when raised out of the water or pressed down into it, is a complex subject and can only be properly achieved through analysis of tank test data. Tank test programmes I have conducted will typically be for at least 4 hull shapes all tested at 4 speeds over the anticipated performance range, and for at least 3 displacements, that represent the heeling angles that correspond to the speeds tested. 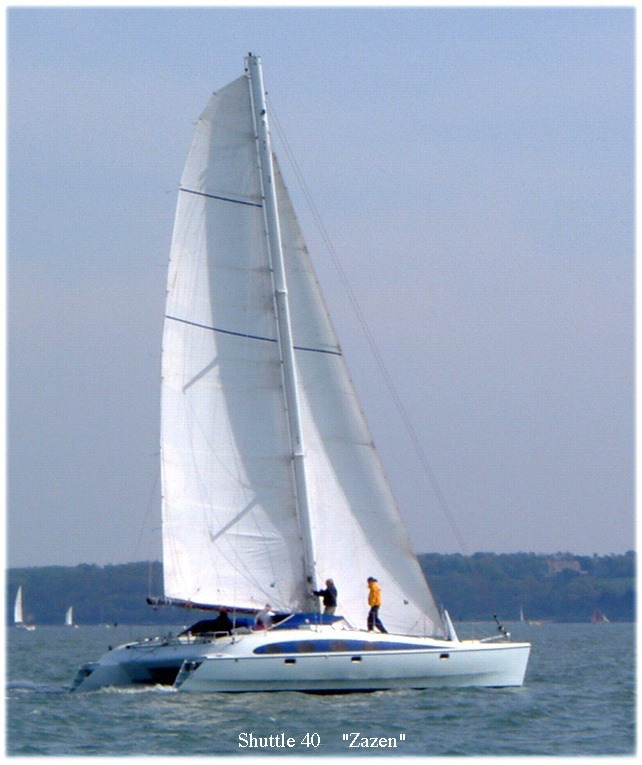 Another complicating factor is that the boat will sail upwind at a lower speed and a high angle of heel, than when it is reaching. Thus the hulls have to be optimised for a complex combination of speeds and immersions. 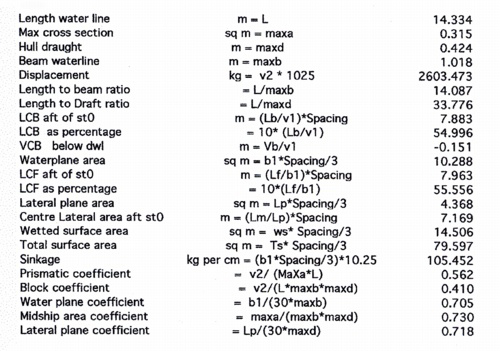 To analyse the tank test data the hydrostatic coefficients shown in the table below are plotted against resistance for all the displacements to find the optimum coefficients for each sailing condition. The hull is then designed with the hydrostatics changing as the boat heels to minimise resistance. The resistance of the more deeply immersed hull dominates the drag but improvements in the shape of the hull when lifting out of the water can also be effective in reducing overall drag. Traditionally the prismatic coefficient has been assumed to be crucial, but my results show that changes in length to beam ratio, length to draft ratio, and wetted surface area cause the greatest changes in hull drag. The fastest 40 ft racer in England weighed 2500 Kgs in racing trim and had a sail area of 125 m2. Performance predictions showed that in order to beat the 40 ft. racers, the 50 would need to weigh less than 4500 kgs in racing trim, including three crew. We decided to see if the boat could be designed to weigh 4000 Kgs to guarantee a faster boat in all conditions and to ensure that the 50 would remain competitive if a faster 40ft racing tri was built. 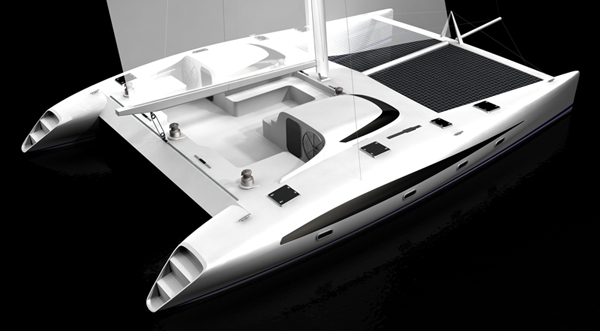 In light winds the Catamaran suffers from high wetted surface area compared to a trimaran, thus the new boat would need more sail area than the Tektron 50 to beat the trimarans in all conditions. Cdtot = total coefficient of aerodynamic drag for the whole boat and rig. 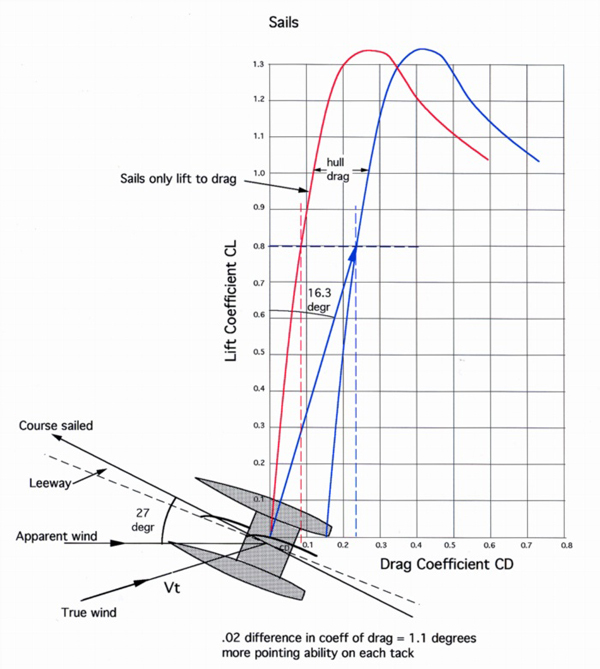 This shows that if sail area is increased the effect of the drag of the hulls in the air is decreased. Large sail area is also important for light airs performance, and in a racing design it will heel the boat quicker, thereby reducing wetted surface area and hence drag. (Ref. 4). So it is important to maximise sail area for racing. I calculated that at a displacement of 4000 Kgs the new cruiser/racer 50 ft Cat could carry a maximum sail area of 160 m2. Maximum sail area is determined by rig height. This in turn is determined by the mast weight and the height of the centre of effort (C of E). If the C of E is too high the boat will tend to bury the bows when fast reaching. This can be controlled by the hull shape as discussed above, but there is a limit to how much the hull can be flared forward without causing more pitching or slowing the boat in all but the most extreme situations. I had already completed an evaluation of Prepreg Carbon construction for a 52 ft Cruiser that I had recently designed, and I drew an initial proposal with a new deck layout, no forward cross beam, and improved structure, and with the hull profile as high as the Tektron 50. Prepregs are fibres preimpregnated with Epoxy resin (the fibres could be Glass Fibre, Carbon fibre, or Kevlar). The fabrics have to be stored in a refrigerator, and are laid onto the mould in a semi-dry state. When the part is heated in an oven to about 80 degrees centigrade, the resin flows and then sets. This method allows lower resin to fibre ratios than any other method of building and is also stronger, because the resins used can have better properties than room temperature cure resins. This means that the boat can be engineered lighter and there is a further weight saving achieved by using less resin. The core material can be PVC foam or Nomex honeycomb. Core-Cel P grade and Rohacell foams can withstand the 80 to 85 degrees centigrade cure temperature. Unidirectional and biaxial cloths are used exclusively in my designs and provide the highest strength to weight ratios. Fig 5 shows the properties of various forms of glass and carbon fibre weaves (the graph was prepared by Devold AMT AS. www.amt.no ) The graph shows how stiffness and strength vary with fibre orientation. For instance a unidirectional fibre is 4 times as stiff with the load applied along the fibre direction than it is when the load is applied at 45 degrees to the fibre direction. I developed a concept called integrated structure in the early 1980's. (Ref 5). This was a way of blending and tapering the structural elements of the boat together in such a way that loads are taken by fibres away from highly loaded areas and dissipated into the hulls in such a way that stress concentrations are avoided. Computer analysis is used to calculate the load at any point in the structure and the direction of that load. The fibres are then tailored in weight and direction to take the load. Even to the point (in larger projects) of having the fabrics specially made to suit the design. Some parts of the boat will be limited by stiffness requirements. For instance the reinforcing forward in the hulls to take the sideloads when the boat falls off a wave, and simultaneously is under full rigging load from the forestay. The hull movement has to be limited to stop the hull moving too far out of line, and to prevent the forestay going slack. This is achieved by 300 mm wide carbon fibre struts built into the hull side, at the widest part of the hull. The layers of carbon are tapered out towards the bow so that the strain in the fibres remains the same as the hull deflects. Maximum deflection in this case will be 6mm for each hull. The main cause of windage,now that the deck edges were rounded, was the fact that most of the wind that hits the hull side has to flow, not over the deck, but along the hull side and out at the stern. Most of the drag is the effect of the wind blowing against the hull side. I reasoned that if I could design a shape that would encourage more air to flow up over the deck and less to flow along the hull, drag could be significantly reduced. Windage can also be reduced by reducing the height of the hull. The new hull shape is shown superimposed over the hull section of the Tektron 50 in fig 2. This diagram shows how the separation point of the air is lowered by the new hull shape, allowing 40% more air to flow over the deck rather than down the hull side. 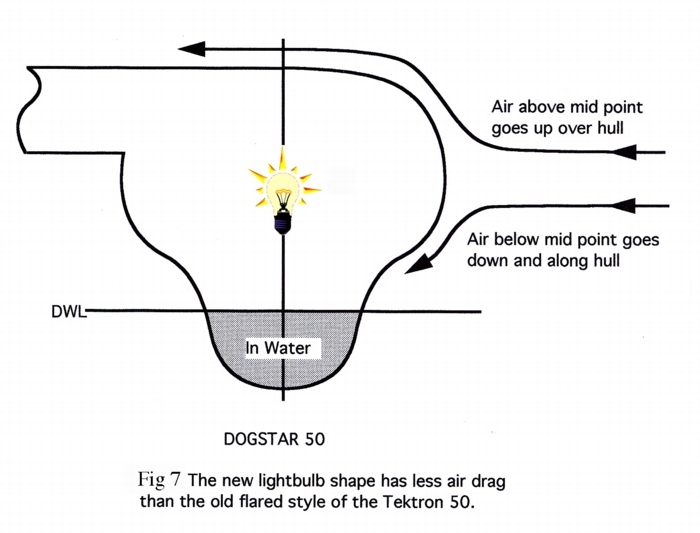 Fig 7 shows how the wind flows over the new lightbulb hull. Side windage drag should be reduced by 20% in the new hull. This reduces the overall drag and will result in the new design pointing 1.2 degrees higher on each tack at the same speed to windward. Resulting in a 2.2 % increase in Vmg. The graph in fig. 8 shows the materials cost vs. weight for the two hulls. The first hull was designed using 4 different combinations of material. The new hull was only designed using Prepreg Carbon with Nomex honeycomb above the waterline. 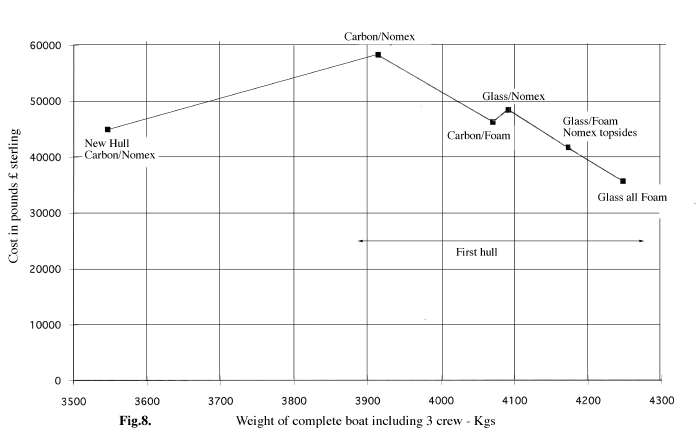 The graph shows that the new hull would meet our criteria with regard to weight, and that it would cost less than the original hull built in a lower technology, namely foam, carbon and glass with a conventional vacuum layup in Epoxy resin. The new hull shape saves significant weight because the reduced area of the hull not only saves weight, but all the bulkheads have less area as well. The lighter structure allows the rig weight, and the crossbeam structure to be reduced. This translates into even lower cost and less weight. The rig is a double diamond swept spreader carbon wingmast of short chord. The jib, which is sheeted at 6 degrees is not self tacking because a small overlap is needed to obtain optimum effect from the slot. On a boat with such narrow sheeting angles, a large chord wingmast rotating near the forward end of the mast tends to close the slot between the jib and the mainsail. Keeping the chord small and rotating the mast aft of the centreline will keep the slot open and will improve sail power upwind. The rig is very tall and a carbon mast will be the lightest option to reduce pitching, and all the rigging apart from the forestay and diamonds will be synthetic fibre instead of stainless steel to reduce weight. Diamonds will be stainless rod for minimum stretch and lowest windage. The forestay is attached to a single fore and aft pole. The striker wires lead slightly aft to reduce the lever arm on the hulls, that support the forestay loads. The hulls will move very slightly inwards under full forestay tension, but will stabilise and support a forestay load of 4000 kgs, which will be required to hold up the leech of the mainsail and to keep the forestay from sagging. A light genoa is flown from the end of the pole and can be used up to 15 knots apparent. The structure to support this pole weighs approximately the same as a forward foil shaped beam which I have used before. The advantages of eliminating this beam are less windage, weight more aft, and less drag if the bow should bury. The mainsail is high aspect ratio with a squared head. This mainsail shape has proved to be the most effective provided that the leech can be kept tight and the power at the top of the sail can be properly utilised. Mainsheet loads will be in the order of 4000 Kgs to power up this main. The all carbon structure will provide the stiffness and strength to support these massive loads. Running backstays are used to give final tension to the forestay and to take up slack as the hulls bend in slightly as they take up the loads. Two daggerboards a required for this design because the boat will be sailed with the windward hull close to leaving the water, and for out and out racing the loss of 1 degree of pointing ability that would result from having only one board to windward, while not significant on a cruiser, will be relevant when racing. The boards are large and asymmetrical, only the downwind board will be used at any time. A nice feature of this design are the cuddies each side that house two navigation stations. A modern racing boat will carry a computer and sophisticated navigation instruments, so that performance can be monitored and navigation decisions can be taken moment by moment, based on polar diagrams of performance stored in the computer. This means that the navigator needs to be sheltered and still have excellent communication with the helmsman. In this design the navigation stations are mirrored so that the navigator can sit inside the shelter of the cuddy at each helm station, and is only 4 feet away from the helmsman. The cuddies also provide sheltered access into the hulls. The port hull is primarily for sleeping with 3 comfortable sized double cabins, and a w.c. and shower. The starboard hull has a large saloon aft and ample galley space amidships. 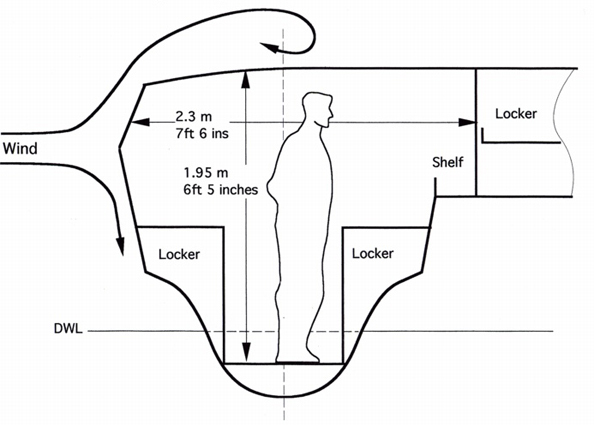 Forward is a sail stowage area with access to the deck through a large hatch. Auxiliary propulsion is by 2 x 15 hp outboards mounted on retractable sleds on each side in front of the aft beam. Only one outboard will be carried on races. 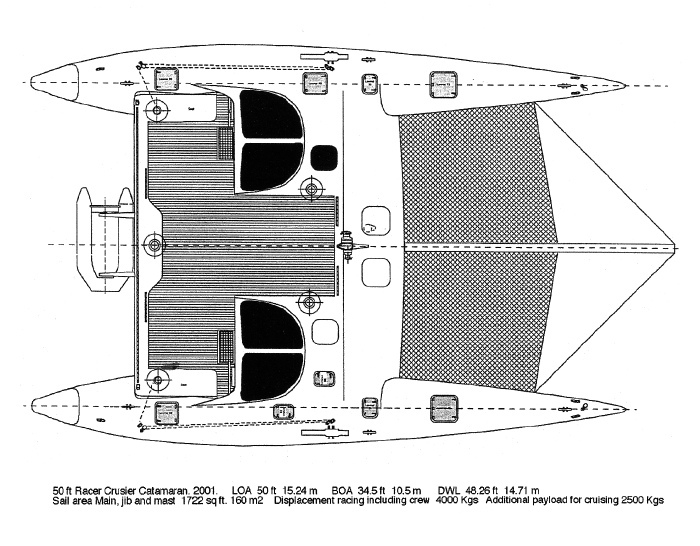 Figure 9 shows the deck plan of the Dogstar 50 and the actual view from 30 degrees off the bow. The area that is presented to the wind is 22.87 m2. Working from the lift to drag graph of expected windward performance of the boat based on the Tektron 50, the coefficient of drag of the whole boat will be 0.726 as opposed to 0.908 for the Tektron 50. The result of these refinements results in a design that will sail significantly faster than the Tektron 50 and should beat the current 40 ft racing trimarans in England as required. The boat still has reasonable accommodation and can be used for cruising as well as racing. 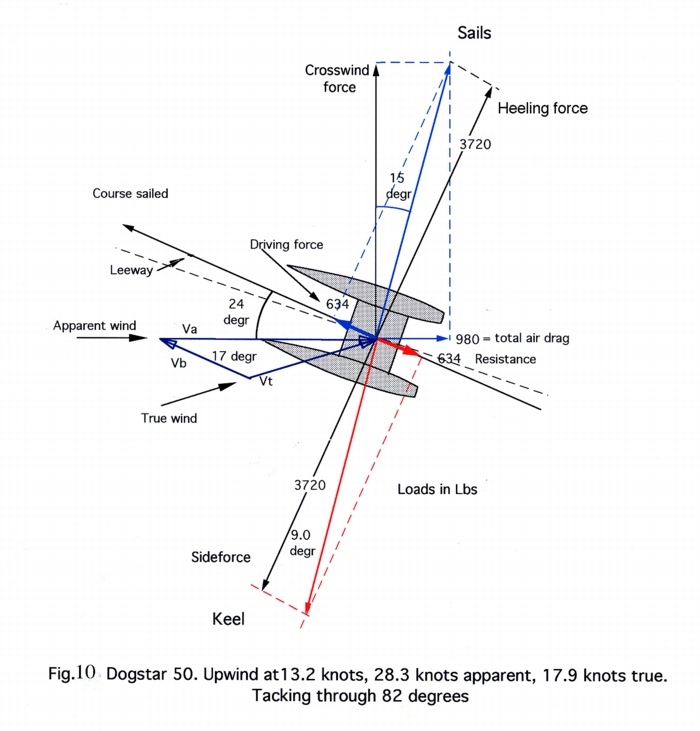 Fig 10 shows the calculated lift to drag of the Dogstar 50 sailing hard on the wind. She will sail faster and closer to the wind than the Tektron 50. The tacking angle will be reduced from 88 degrees at 12.5 knots to 82 degrees at 13.2 knots resulting in an increase in Vmg of 10%. Reaching speed will be 12% higher than the Tektron 50. I think this is an excellent example of how form follows function. The function was to reduce windage and weight, the form evolved as a result of this and then we discovered it was going to cost less to build the faster boat in the latest technology. 13 years have passed since I designed the Tektron 50, much has changed. Stronger lighter materials are available. 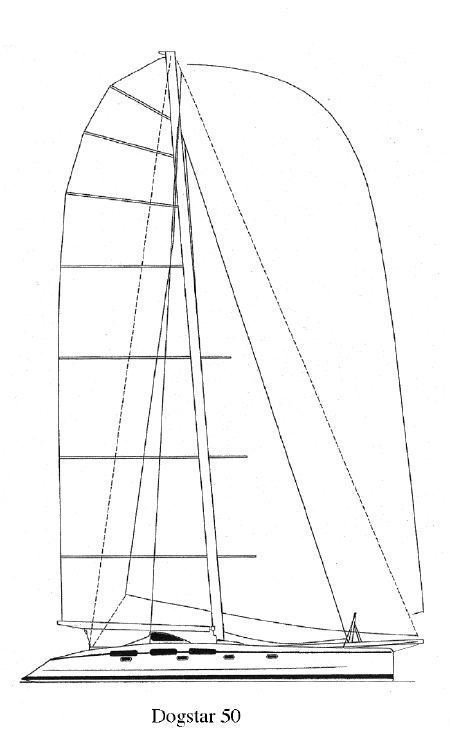 Building techniques have advanced, and sail plans have developed with a greater understanding about the pros and cons of wing masts. These are significant performance gains, and reflect the changes in design understanding, experience gained, and technical advances in materials. I wonder if we will be able to make such large gains in the next 13 years. 2. Aero-Hydrodynamics of Sailing. C.A. Marchaj Adlard Coles Ltd. U.K. 1979. 3. Sailing Theory and Practice. C.A. Marchaj Adlard Coles Ltd. U.K. 1964.